Kitchen queens, foodies, busy moms, and pretty much everyone else has been raving about one relatively new and ridiculously versatile gadget lately: The Instapot (colloquial for Instant Pot). By now, it has become quite the phenomenon in the blogosphere and kitchens all around the world. You might either be wondering “What the heck is it?” or “sure, but is it really worth the hype?”… Maybe you’re already at a place of using this awesome tool pretty much daily and couldn’t imagine your kitchen without it. We’d like to offer you an objective overview here in this article so you can determine whether you should make space on your countertop for yet another tool. Whether it will fit in with your cooking needs and is worth the investment. Though pressure cookers have been around for a while, electric ones are quite new. The basics of how these machines operate are pretty similar, but there are a lot of different models and functions to consider. Distinguishing between which options are useful and which ones are just for show is no easy feat and quite frankly, can seem like an overwhelming task. That’s why we want to showcase the many differences between these models and see how each one stacks up in this article, bringing you one step closer to a solid decision. 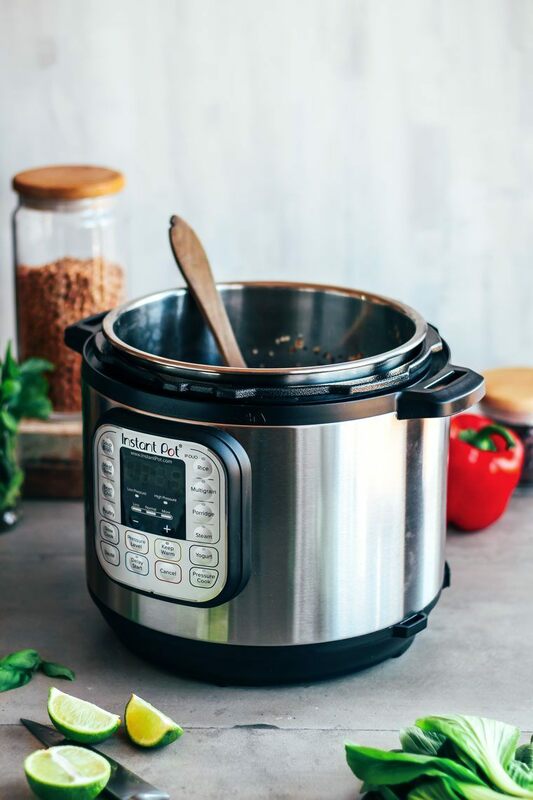 The Instant Pot is an awesome all-in-one device that saves time and allows for hands-off homemade meals, batch-cooking or quickly whipping up beans and grains from dry. We use and recommend the DUO60! It's affordable, well-built, and has just the right size. It slow cooks, steams, sautés, makes rice, and even yogurt all the while not being as complicated as some of the more expensive models. What exactly is an Instapot, anyway? There are a bunch of myths and truths surrounding this kitchen appliance out there, so let’s get the facts straight first. This means that it can replace many other kitchen tools like your crockpot, slow cooker, rice cooker, yogurt maker, traditional pressure cooker for the stovetop, as well as various pots and pans. In other words, you can get rid of all of your small cooking appliances and just use the Instant Pot instead – there is very little that it can’t tackle in the kitchen. During our research, we saw several people calling it the “Swiss Army Knife” of kitchen appliances and we totally agree with that! While the Instapot does what a basic pressure cooker usually does, it also offers a lot more functions. It is convenient and much easier to use, and comes with built-in safety features – so no more horror stories of exploding pressure cookers here! Probably one of the biggest advantages of the Instapot is its ability to cook most foods/meals in a fraction of the time – but more on this down below. Moreover, unlike traditional pressure cookers and conventional cooking techniques, the Instant Pot offers a “set it and forget it” option for all meals. You can just set it to cook for as long as necessary and walk away – no need to stay in the kitchen and watch it. It will do its own thing. The Instapot comes in lots of different sizes and varied functions that can fit all of your household needs. To help you chose which one would be best suited for your kitchen, we’ll go over the pros and cons of the varied models and functions. But first, let’s see what makes this kitchen device so popular. But why is it so awesome, you ask? The Instapot is truly a hands-off cooking appliance. Your job is to throw all ingredients for the delicious meal inside and simply press a button. After that, you’re free to go about your day – no babysitting in the kitchen needed. With a regular (stove-top) pressure cooker, you need to be present in the kitchen to regulate the heat and release the pressure once the food is done, so even though you’re saving on time, you’re not really getting “free” time for yourself – you’re still stuck in the kitchen. This is exactly what makes the Instant Pot so convenient, as no other cooking device offers quite as much freedom. The device is also super quiet during the whole process, apart from a bit of hissing in the beginning. Not to mention that once the food is done, you get to enjoy the meal and walk away with a clean kitchen – no messes to take care of from things bubbling, or even worse, spilling on the stove-top. It is particularly easy to use once you get the hang of the different functions. With the built-in timer, you can set it up in the morning and you’ll have a hot meal waiting for you once you get home from work. And what if you get stuck with an unforeseen work emergency and get home a couple hours late? The Instapot is programmable and will keep your food warm for 10 hours after cooking. Basically, no matter how late you get home, your food will be warm and just waiting for you to dig in. If you have a small, cramped-up kitchen, you’ve probably figured out already how precious your countertop real-estate is. 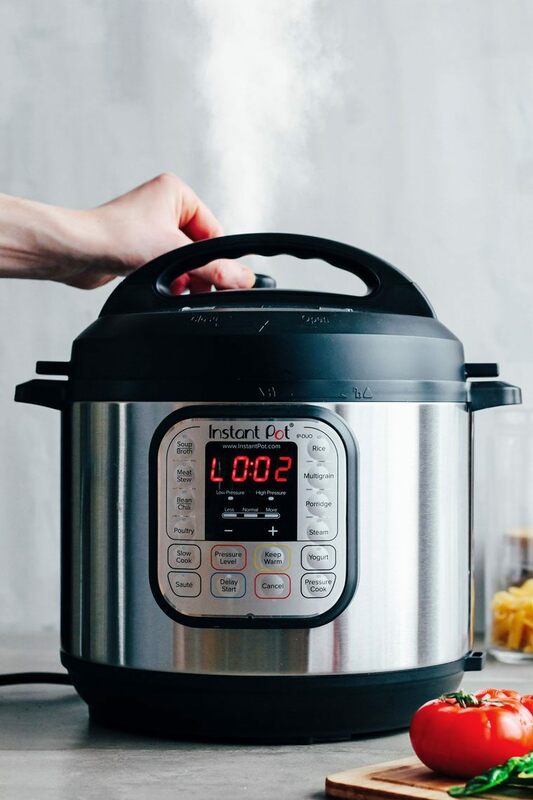 The Instant Pot is an amazing small kitchen savior as it replaces a whole lot of bulky kitchen appliances, like your crockpot/slow cooker, rice cooker, yogurt maker, traditional pressure cooker for the stovetop, and various pots and pans. It works great for your dorm room as well, especially since most dorm rooms don’t come with a built-in stove-top. All you need is an electrical socket to plug it and it won’t take up much space. The Instapot covers all different cooking scenarios and tells you which function to use for whatever it is you’re cooking - but you can quite as easily use the “manual” function for when you need more control on how long you want to cook the meal or want to change the pressure from high to low. The Instapot is very accurate with cooking times, temperatures, and the pressure it uses to cook the food, thus keeping things as flavorful as possible and preserving their natural taste nuances. Thanks to the pressure it uses to cook things fast, and the lower cooking temperature when compared to a stovetop, it preserves the nutrients in your food better - giving you healthier meals to enjoy. Not to mention that with the option to cook things fast, you’ll be more inclined to try new things. Why stick to the mushy quick-cooking oats, when you can make a delicious porridge from whole oat groats (or steel-cut oats) in no time and enjoy all of the nutrients whole oats come with? And if you’re someone that travels a lot, you understand how tricky it is to eat healthy when your only option is eating out all the time. Well, the smallest version of the Instapot is so portable; you can take it with you to your hotel room! Just plug it in the nearest socket and you can enjoy a healthy meal from the comfort of your own room. And just think about all of the money you’ll be saving from not eating out every single time you get hungry. The Instapot is your kitchen’s piggy bank for the 21st century. You’ll be able to save a decent amount of money and produce less waste, just by using the Instant Pot to create your own pantry staples. Plus they will taste 10 times better and will be much healthier, especially when compared to their canned equivalents which can come with loads of additives. 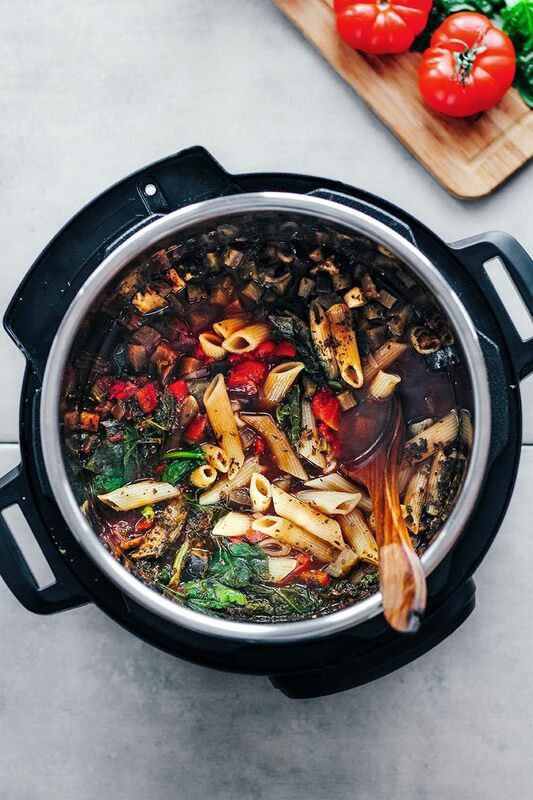 From home-cooked beans and tomato sauces to vegetable stock made with kitchen scraps of produce that doesn’t look too appealing, there is very little you can’t do with your Instapot. It is also very energy-efficient as once you put it to work, it seals in and keeps all that warmth and steam inside, requiring much less time and energy to cook your meal compared to the stovetop. When you take all of this into consideration, two things will inevitably change in your home. Your monthly electricity bills will go down and your garbage will finally take a breath now that you won’t be cramming it with empty cans and cartons all the time. The Instapot is built to last. It has a 100% stainless steel interior, which means this is the only thing your food will touch. Stainless steel is also a breeze to clean, plus the Instant Pot is dishwasher-safe, so no need to worry about scrubbing anything for hours. It comes with built-in safety mechanisms, so if you’ve grown up with the story about someone’s aunt burning her face with a pressure cooker, it’s time to put your worries to the rest. It comes with a pressure regulator, which makes sure the working pressure is always below the safety limit. Finally, the price point is pretty reasonable, especially if you take into consideration how many gadgets it can replace. For the price of just one or two single-use kitchen appliances, you can buy the Instapot and replace at least 3 individual kitchen items – which you could simply sell again. 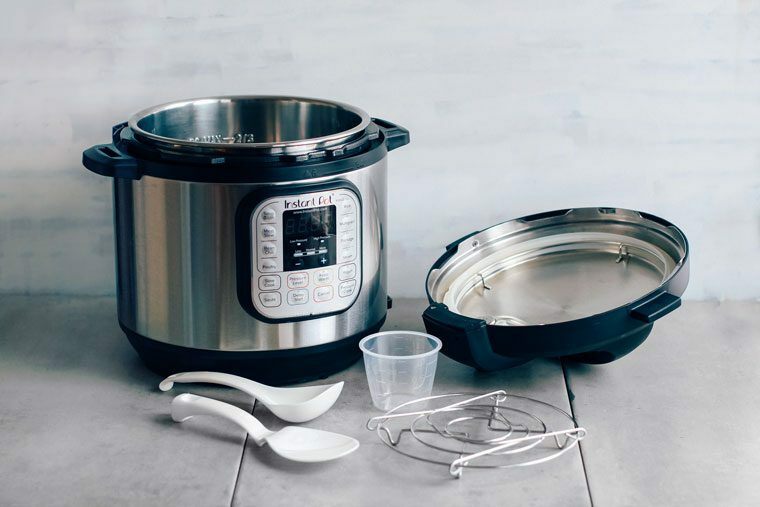 What we love is that each Instant Pot comes with a bunch of useful accessories such as a trivet or steamer rack, rice paddle, soup scoop, and measuring cup. This give you a great place to start out before looking into any other add-ons for specific uses. We didn’t joke about just how versatile the Instapot is – but we don’t use all of its functionalities daily, of course. It definitely opened up a new world of cooking for us and we’d like to share our favorite uses of this device here. One of our favorite parts is that once you see how easy (and fast!) it is to cook some of the things you wouldn’t dare touching before (boiling beans for 4 hours anyone? ), you’ll gain a new-found kitchen confidence and you’ll start experimenting more and more every day. This is something that normally takes several hours and lots of electricity, which is why most of us usually reach for the cans. Not with the Instapot! It tackles dry beans in 30-40 minutes and soaked beans in as little as 10-15 minutes. The taste isn’t even comparable to canned beans and you can decide how soft you want them to be. What’s even better, the beans cooked in the Instapot are also much more digestible due to the high pressure. Whole grains can take hours on a regular stove-top and sometimes even with your best efforts, they can turn mushy or goopy. The Instapot makes perfect brown rice (and an even better risotto with none of the stirring! ), creamy polenta, fluffy quinoa and wheat berries, just to name a few. We’ve even cooked whole potatoes, sweet potatoes, and a whole pumpkin in it! We also love to make our quick oatmeal or steel-cut oats overnight, using the delayed overnight function. The Instapot comes with a trivet for steaming and your vegetables will be ready in just 1 or 2 minutes. Perfect in-a-hurry lunch or dinner! The quick steaming method will keep all of the nutrients intact and the taste is much nicer compared to steamed veggies from a normal pot. And for those times when you don’t have any fresh veggies around, you can steam frozen veggies straight out of the freezer – no need to thaw them first. Just keep them for a minute longer and they’ll come out perfect. 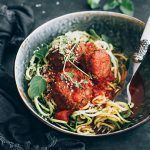 We like making many of our pantry staples with the Instapot as not only are we saving so much money this way, but the taste is so much better and we like being in control of all the ingredients that go into the recipe. Truth be told, we’re not perfect and sometimes laziness or busy times will get the better of us so we’ll just buy everything from the store. But we’re giving it our best. We like to make our own veggie stock using vegetable scraps from various meals. Sometimes we also throw in some greens that have started to wilt or root veggies that look like they’ve seen better days. We also prepare our own tomato sauce when tomatoes are in season and very cheap, as well as homemade applesauce during fall, spiced with cinnamon. The apples cook down in the Instant Pot and become so sweet that you don’t need to add any additional sweeteners. It is so good; we eat it by the spoon as a quick snack. One pot pasta, risotto, soups, stews, curry, and bean chili. We really enjoy the delayed cooking options the Instapot offers. Like programming it to cook rice or pasta while we’re out and then coming home to a warm and satisfying meal. This is also very useful if you find yourself with the time to prep your meal in the early morning or late at night, but you don’t want to actually start cooking right away. Just use the delayed cooking option and your meal will be perfectly timed for when you’re ready to eat. And if your plans change and you end up getting home late, the meal will stay nice and warm in the Instapot. We also like the overnight cooking as there is nothing better than waking up to a house filled with the delicious aroma of warm cinnamon porridge. There’s an option to make vegan yogurt – just 2 ingredients and insanely delicious! But be aware that not every model comes with this function (will be explained later). What’s with all these functions and settings? Since the Instapot is quite a unique kitchen appliance, it does come with a bit of a learning curve. 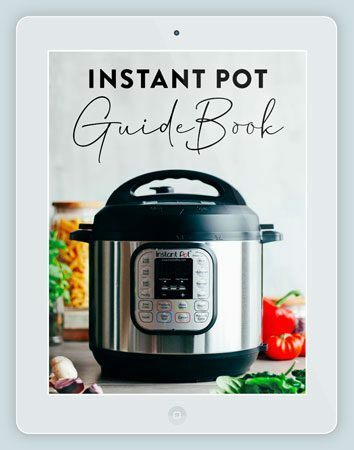 There’s a lot to be explained and taught here, so reading the manual that the Instant Pot comes with should be your first step. We’ve decided to explain some of the most-used features here so you don’t end up feeling overwhelmed from the start. Here are the important functions at a glance! Since the Instapot is quite a unique kitchen appliance, it does come with a bit of a learning curve. There’s a lot to be explained and taught here, so reading the manual that the Instapot comes with should be your first step. When cooking time has elapsed, the Instapot automatically switches into the “keep warm” setting - to go from keep warm into standby, just hit the button again and vice versa. If you messed up with your cooking time settings and the pot has started warming up, just hit the button and restart the programming. Be aware that steam comes out from the top of the pot. There’s a valve that needs to be sealed before cooking and that can be moved to either side to release the steam manually. You need to be careful when doing this because a lot of hot steam will have accumulated during cooking, so make sure not to burn your skin. Especially with meals that are more on the watery side like soups or stews - they might splatter a little, so only move it ever so slightly and not all the way. You can also use an old towel to cover up the valve when releasing the pressure. The natural release method is better and safer in many cases, but shouldn’t be used for all types of food. What this means is that you simply let the pot cool down naturally until the float valve drops down, which can take anywhere from 10-30 minutes. Then, there’s also the 10-minute release method, which just means that once the cooking cycle is complete and the pot moves into “keep warm” mode, you wait 10 minutes and then press “cancel” and release the handle. Who is it for? And Which One Should You Get? As much as we personally love the Instapot, you need to determine whether it makes sense for you to get one and whether it will fit into your lifestyle. All we want here is to share our excitement and some information about this but in the end, it should be of value for you. If you’re a health nut – the Instapot is great for cooking healthier, more nutritious meals. You can meal prep your meals and use the IP to cook everything in a fraction of the time - most meals freeze well, too. If you have a tiny kitchen – Counter space is precious in a small kitchen and the Instapot barely takes any, all the while replacing a lot of bulky kitchen appliances. If you don’t have a stove-top – A savior for college kids as it only needs an electrical socket to work. No more greasy cafeteria food! 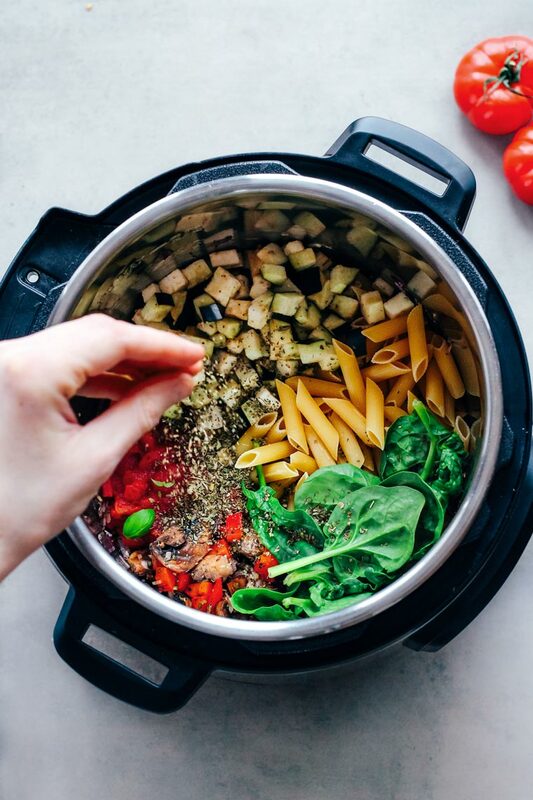 If you travel frequently – If you’re often times on the road, but still want to eat healthy and nutritious meals, the Instapot can be a lifesaver. You can plug it in your hotel room and enjoy a home-cooked meal even on your travels. If you’re a lazy cook – One-pot meals and batch cooking is like second nature to a lazy cook that doesn’t want to be bothered with putting too much effort in the kitchen and nothing beats the Instapot at this style of cooking. Not to mention that it takes only a minute or two to clean and can also be put in the dishwasher. If you’re on a budget – Cooking your own food from scratch can really save the bank when you’re on a tight budget. The cans or cartons of prepared food can really add up and buying dry legumes or grains in bulk is so much cheaper. Plus, you’ll save on the electric bill. If you’re an environmentalist – As mentioned above, you’ll produce less waste by buying your food in bulk and using less electricity is also easier on the environment. Also, you’re more likely to stick to plant-based protein sources like beans which can drastically reduce your carbon footprint. Do you fall into one/any of the categories mentioned above? Then keep on reading. Let’s try to figure out which model and size would work best for you! How many people do you want to feed? Just yourself, your partner, or a large family? Which foods or meals do you want to prepare? Do you need a yogurt making function? How much space do you have in your kitchen or room? Do you really need all of the functions? Some models like the „smart/ultra“ might be too fancy for most people. The table below shows you exactly which functions the models comes with. In terms of best value for money, the “duo” is our preferred option for most people. Note: The above buttons will redirected you to respective product pages on Amazon. All Instant Pots include: Recipe Booklet, Soup Spoon & Rice Paddle, Measuring Cup, Stainless Steel Cooking Pot & Steam Rack. This model probably gives you the most bang for your buck and it will be the best choice for most cooks. It can do everything the LUX does but also has the yogurt function! Choose between two pressure settings and 14 smart programs for your meals. It gives you lots of various options without being too complicated, the perfect choice for starting out! The DUO is the most successful, and also best rated model of the series. The cheapest option of all 5 models, the LUX has all basic functions (10 smart programs) but it does lack the on-touch yogurt making capability. It also operates on one level of pressure cooking, no option for choosing high or low here. If you’re not into these two extra functions, save around 20 bucks and get this one! You’ll notice a true upgrade from the first two models here. The Duo Plus comes with a large blue LCD screen which displays the cooking status and has beeping sounds that can be turned on or off. It also remembers your last cooking time and settings – on top of that, it offers 3 more cooking programs. Cake-making is now possible! Enjoy improved usability and custom features with this model. Yes, smart, as in: works with your smartphone! This techy model is a top-of-the-line edition that offers Bluetooth connectivity so you can monitor on your phone how the beans or rice are doing while you’re not in the kitchen. Additionally to the 14 smart programs, you can now also customize and save 2 personalized programs for your convenience. The best choice for all tech geeks. The Ultra has the most features but also the heftiest price tag of all Instant Pots. It comes with features like choosing any temperature, pressure level, cooking time, delay time, and even adjusting the pressure for your altitude! So, when you’re living up the mountains or moving around a lot, this is your best bet. The Ultra brings a completely new interface with a spin dial while cutting back on too much complexity. This makes it the perfect models for those who want the most granular control over their device. Alright, are there any Downsides at all? Yes. Just like everything in life, something has to give. Even though we think it’s overall totally worth it, we don’t want to keep any information from you. here are a few common issues Instapot users have and you need to decide whether it’s a net positive for you. The following paragraphs will also answer some questions for you! For most of us, the Instapot is in a price range that makes you think twice at first (around 100 bucks, depending on the model). 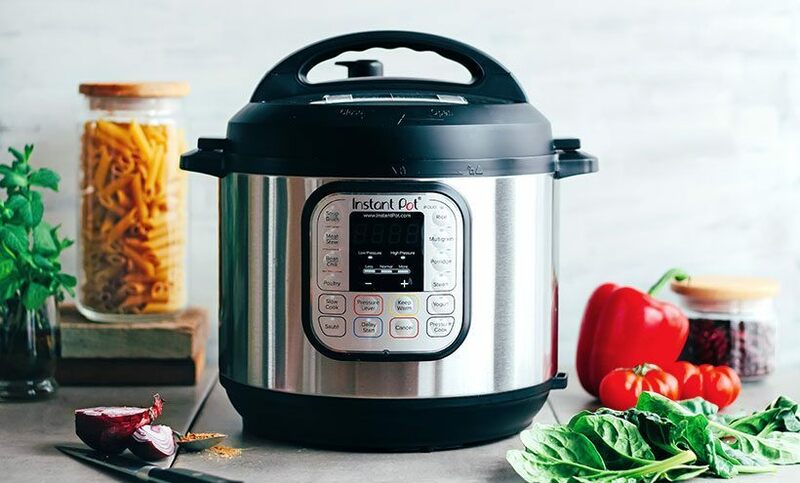 The only downside to the price is that you need to spend it all at once, but in our opinion, the Instant Pot soon pays for itself. You can replace a lot of appliances with it (or even sell some if you already own them) and you’ll save both time and money when using it. It’s not the most intuitive device at first so you should check the manual before using it. A little trial and error is involved, as you need to find out what the specific cooking times are and how much water/liquid you need to use. There’s a cooking chart and more helpful stuff that comes with the Instapot. Plus, you can get our free guidebook with inside tips and learn all about what you need to know before getting started! It’s different from stovetop pressure cookers and recipes need to be translated. The cooking time can also be misleading as it takes time to get to pressure and later on, release the steam, and they are often not factored in. That being said, there are a ton of Instapot recipes already out there and once you get the nag of it, you’ll be able to determine most cooking times on your own. If you want to prepare both sweet and savory dishes with the Instapot (and you probably will!) be sure that over time, the inner pot can start to smell rather garlicky and this doesn’t make for a good dessert touch. An inner pot is relatively cheap and it allows you to always have one to use while the other one stores food in the fridge or is in the dishwasher. We certainly wished we got the Instapot sooner! It really does take cooking to the next level and for us and it allowed us to get creative in the kitchen with new things and recipes. We’ve really gotten into the flavor of home-cooked legumes and pressurized veggies. Plus, we were able to reduce our waste by buying way less canned food. Ever since we got it, it has slowly but surely become our most used kitchen tool and we now use it almost every single day. 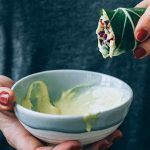 From meal prepping our dinners in busier times to making leisurely breakfasts on the weekend, in our minds, it has paid for itself a long, long time ago. It is a convenient tool that allows us to have a healthy meal every day with as little effort as possible. Coming home to a warm meal and not having to spend time in the kitchen after a long and stressful day has since become a little life pleasure for us. No wonder it’s been sold-out for months at some point and you could only get a handful of devices for triple the price on eBay. The only true downside, in our opinion, is that it needs some getting used to until you master cooking with it. But every other aspect of putting a healthy, delicious meal on the table will be so much easier. Of course, you need to figure out how much use you’ll get out of it, but it definitely gets a green light from us! Lars is the guy for all things technical of this site but likes to write the occasional article, too. He has a degree in computer science and media and has been vegan since 2010. He loves nourishing plant-based food (that one was obvious), playing tennis, and making noises with his guitar sometimes. Oh, and he's got a weird obsession for peanuts and coconuts. You mentioned so awesome food options for the instant pot: veggie stock w/veggie scraps, 2-ingredient yogurt, etc. where can I find these recipes? I just got my Instapot this week and have used it to make a delicious lentil soup. I also bought a second inner cooking pot, I think that’s a great idea. I can’t wait to check out your recipes! woohoo, we’re excited for you! Taking your cooking to the next level, hehe… I’m sure there’s a lot to be discovered for you. have you checked out the recipes? Hope you like em! To be fair, there are a couple of “not so magical” and real-life things about the Instant Pot that we wanted to mention. But overall, it’s a pretty exciting tool and we’re so happy to have it. Just don’t want anyone to think it’s 100% great and easy and all without any downsides. 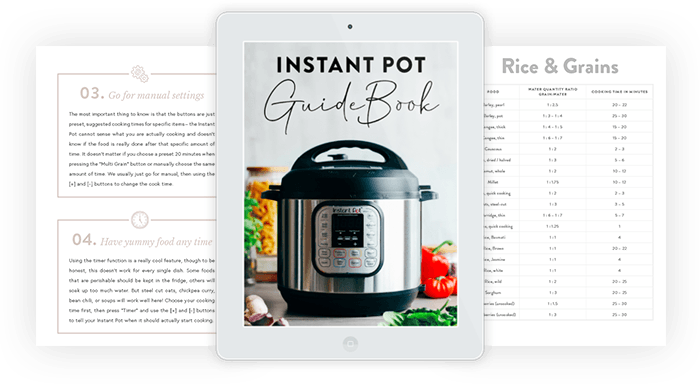 I’ve been using an Instant Pot for several years now and LOVE it! I use it several times a week – it’s so handy! That pasta dish in your photos looks like heaven, by the way! Wow! What a thorough and detailed review of the Instant Pot. Really awesome! I love the photos and icons, too. This is probably the best article I’ve seen on Instant Pots! I don’t know if I could get rid of my other appliances, but if this is as handy as it sounds, then I may have to invest in it. The biggest thing is that I mostly see meat-based dishes, and so that has turned me away in the past. Yes, same here! Lots of people from the starch-based diet, McDougall style, have started using Instant Pots a couple of years ago to make their simple rice and bean dishes which intrigued us. And to share the awesome results with everyone, we really wanted this to be an extensive and interesting article overall :) Thanks for the great feedback, no need to give up any appliances if you find them still useful after purchasing an IP! Loved the review. I am planning to get 10 in 1 instapot. It’s slightly expensive than other but I hope it will the right choice for its features. Sounds great, Paul – glad we could add something valuable! Wow! Such an informative post! Believe it or not, I do not yet have an Instant Pot. It’s definitely on my list though! Love your comprehensive guide on your experience with yours. Thanks! Nah, obviously you can get by with a normal pot or slow cooker for many recipes. Glad we could make the Instant Pot a bit more appealing to you with this article! This is an awesome review. Always thinking about buying one. Do it if you can, Jasmin! I haven’t heard anyone saying they regret it – and it’s really not that expensive anymore, luckily. Thanks for the feedback! Thanks for sharing such awesome reviews! Thanks for sharing all information about Instapot Reviews. Do you happen to know the different in the footprint size (i.e diameter and height) between the 6 quart and the 8 quart. I haven’t been able to find that info anywhere. Thanks. The 6 Quart Duo weighs 6.61 kg/14.57 lbs and measures 33x31x32 cm/13×12.2×12.6 in (LxWxH) whereas the 8 Quart version weighs 8.62kg/15.21lbs and measures 37.6×33.8×36 cm/14.8×13.3×14.2 in. It is awesome since I found lots of great recipes with instapot. We can make lots of delicious meals with easy recipes. My husband and kids love meals made with instant pot since it is easy to cook. On a different note – it’s not an InstaPot. It’s an Instant Pot. I grow almost all my own veggies since moving to the country. The one thing I did not see in your review is if you can can with this, not just tomatoes but all veggies? Does it meet the safety guidelines for home canners? I NEED to know why My Instapot mac and cheese turns out watery and the cheese melts in sticky globs. I have tried several recipes, but they all produce the same runny dish. I use good cheddar cheese and Jack mixed.